A stomach ulcer that was diagnosed as cancer on biopsy and surgically removed. Stomach cancer, also known as gastric cancer, is cancer developing from the lining of the stomach. Early symptoms may include heartburn, upper abdominal pain, nausea and loss of appetite. Later signs and symptoms may include weight loss, yellowing of the skin and whites of the eyes, vomiting, difficulty swallowing, and blood in the stool among others. The cancer may spread from the stomach to other parts of the body, particularly the liver, lungs, bones, lining of the abdomen and lymph nodes. The most common cause is infection by the bacterium Helicobacter pylori, which accounts for more than 60% of cases. Certain types of H. pylori have greater risks than others. Other common causes include eating pickled vegetables and smoking. About 10% of cases run in families and between 1% and 3% of cases are due to genetic syndromes inherited from a person's parents such as hereditary diffuse gastric cancer. 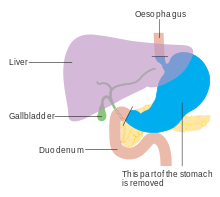 Most cases of stomach cancers are gastric carcinomas. This type can be divided into a number of subtypes. 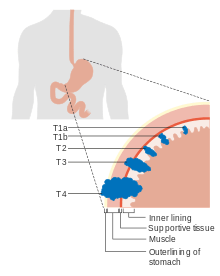 Lymphomas and mesenchymal tumors may also develop in the stomach. Most of the time, stomach cancer develops in stages over years. Diagnosis is usually by biopsy done during endoscopy. This is followed by medical imaging to determine if the disease has spread to other parts of the body. Japan and South Korea, two countries that have high rates of the disease, screen for stomach cancer. Globally stomach cancer is the fifth leading cause of cancer and the third leading cause of death from cancer making up 7% of cases and 9% of deaths. In 2012 it occurred in 950,000 people and caused 723,000 deaths. Before the 1930s in much of the world, including most Western developed countries, it was the most common cause of death from cancer. Rates of death have been decreasing in many areas of the world since then. This is believed to be due to the eating of less salted and pickled foods as a result of the development of refrigeration as a method of keeping food fresh. Stomach cancer occurs most commonly in East Asia and Eastern Europe. It occurs twice as often in males as in females. Gastric cancer occurs as a result of many factors. It occurs twice as common in males as females. Estrogen may protect women against the development of this cancer form. Helicobacter pylori infection is an essential risk factor in 65–80% of gastric cancers, but only 2% of people with Helicobacter infections develop stomach cancer. The mechanism by which H. pylori induces stomach cancer potentially involves chronic inflammation, or the action of H. pylori virulence factors such as CagA. It was estimated that Epstein–Barr virus is responsible for 84,000 cases per year. Other factors associated with increased risk are AIDS. Dietary factors are not proven causes, but some foods including smoked foods, salt and salt-rich foods, red meat, processed meat, pickled vegetables, and bracken are associated with a higher risk of stomach cancer. Nitrates and nitrites in cured meats can be converted by certain bacteria, including H. pylori, into compounds that have been found to cause stomach cancer in animals. 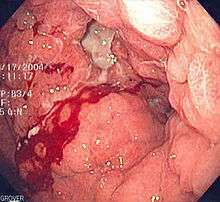 Gastric adenocarcinoma is a malignant epithelial tumour, originating from glandular epithelium of the gastric mucosa. Stomach cancers are overwhelmingly adenocarcinomas (90%). 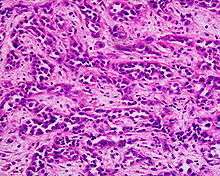 Histologically, there are two major types of gastric adenocarcinoma (Lauren classification): intestinal type or diffuse type. Adenocarcinomas tend to aggressively invade the gastric wall, infiltrating the muscularis mucosae, the submucosa and thence the muscularis propria. Intestinal type adenocarcinoma tumour cells describe irregular tubular structures, harbouring pluristratification, multiple lumens, reduced stroma ("back to back" aspect). Often, it associates intestinal metaplasia in neighbouring mucosa. Depending on glandular architecture, cellular pleomorphism and mucosecretion, adenocarcinoma may present 3 degrees of differentiation: well, moderate and poorly differentiated. Diffuse type adenocarcinoma (mucinous, colloid, linitis plastica, leather-bottle stomach) tumour cells are discohesive and secrete mucus, which is delivered in the interstitium, producing large pools of mucus/colloid (optically "empty" spaces). It is poorly differentiated. If the mucus remains inside the tumour cell, it pushes the nucleus to the periphery: "signet-ring cell". Treatment for stomach cancer may include surgery, chemotherapy, and/or radiation therapy. New treatment approaches such as biological therapy and improved ways of using current methods are being studied in clinical trials. Surgery remains the only curative therapy for stomach cancer. 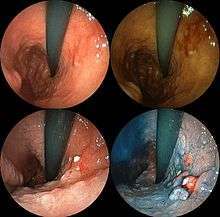 Of the different surgical techniques, endoscopic mucosal resection (EMR) is a treatment for early gastric cancer (tumor only involves the mucosa) that was pioneered in Japan and is available in the United States at some centers. In this procedure, the tumor, together with the inner lining of stomach (mucosa), is removed from the wall of the stomach using an electrical wire loop through the endoscope. The advantage is that it is a much smaller operation than removing the stomach. Endoscopic submucosal dissection (ESD) is a similar technique pioneered in Japan, used to resect a large area of mucosa in one piece. If the pathologic examination of the resected specimen shows incomplete resection or deep invasion by tumor, the patient would need a formal stomach resection. A 2016 Cochrane review found low quality evidence of no difference in short-term mortality between laparoscopic and open gastrectomy (removal of stomach), and that benefits or harms of laparoscopic gastrectomy cannot be ruled out. Worldwide, stomach cancer is the fifth most common cancer with 952,000 cases diagnosed in 2012. It is more common in men and in developing countries. In 2012, it represented 8.5% of cancer cases in men, making it the fourth most common cancer in men. In 2012 number of deaths were 700,000 having decreased slightly from 774,000 in 1990 making it the third leading cause of cancer death after lung cancer and liver cancer. In 2014, stomach cancer accounted for 0.61% of deaths (13,303 cases) in the United States. In China, stomach cancer accounted for 3.56% of all deaths (324,439 cases). The highest rate of stomach cancer was in Mongolia, at 28 cases per 100,000 people. 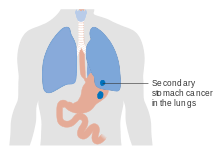 In the United Kingdom, stomach cancer is the fifteenth most common cancer (around 7,100 people were diagnosed with stomach cancer in 2011), and it is the tenth most common cause of cancer death (around 4,800 people died in 2012). Incidence and mortality rates of gastric cancer vary greatly in Africa. The GLOBOCAN system is currently the most widely used method to compare these rates between countries, but African incidence and mortality rates are seen to differ among countries possibly due to the lack of universal access to a registry system for all countries. Variation as drastic as estimated rates from 0.3/100000 in Botswana to 20.3/100000 in Mali have been observed. In Uganda, the incidence of gastric cancer has increased from the 1960s measurement of 0.8/100000 to 5.6/100000. Gastric cancer, though present, is relatively low when compared to countries with high incidence like Japan or China. One suspected cause of the variation within Africa and between other countries is due to different strains of the Helicobacter pylori bacteria. The trend commonly seen is that H. pylori infection increases the risk for gastric cancer, however this is not the case in Africa giving this phenomenon the name the “African enigma.” Although this bacteria is found in Africa, evidence has supported that different strains with mutations in the bacterial genotype may contribute to the difference in cancer development between African countries and others outside of the continent. However, increasing access to health care and treatment measures have been commonly associated with the rising incidence, particularly in Uganda. 1 2 3 "Gastric Cancer Treatment (PDQ®)". NCI. 2014-04-17. Retrieved 1 July 2014. ↑ Sim, edited by Fiona; McKee, Martin (2011). Issues in public health (2nd ed.). Maidenhead: Open University Press. p. 74. ISBN 9780335244225. 1 2 3 4 5 6 7 8 9 10 World Cancer Report 2014. World Health Organization. 2014. pp. Chapter 5.4. ISBN 9283204298. ↑ Chang, A. H.; Parsonnet, J. (2010). "Role of Bacteria in Oncogenesis". Clinical Microbiology Reviews. 23 (4): 837–857. doi:10.1128/CMR.00012-10. ISSN 0893-8512. PMC 2952975 . PMID 20930075. 1 2 3 4 5 6 7 8 9 10 11 Orditura, M; Galizia, G; Sforza, V; Gambardella, V; Fabozzi, A; Laterza, MM; Andreozzi, F; Ventriglia, J; Savastano, B; Mabilia, A; Lieto, E; Ciardiello, F; De Vita, F (February 2014). "Treatment of gastric cancer." (PDF). World Journal of Gastroenterology. 20 (7): 1635–49. doi:10.3748/wjg.v20.i7.1635. PMC 3930964 . PMID 24587643. 1 2 3 "Chapter 1.1". World Cancer Report 2014. World Health Organization. 2014. ISBN 9283204298. ↑ Khleif, Edited by Roland T. Skeel, Samir N. (2011). Handbook of cancer chemotherapy (8th ed.). Philadelphia: Wolter Kluwer. p. 127. ISBN 9781608317820. ↑ Moore, edited by Rhonda J.; Spiegel, David (2004). Cancer, culture, and communication. New York: Kluwer Academic. p. 139. ISBN 9780306478857. ↑ "Guidance on Commissioning Cancer Services Improving Outcomes in Upper Gastro-intestinal Cancers" (PDF). NHS. Jan 2001. ↑ Chandanos E, Lagergren J. Oestrogen and the enigmatic male predominance of gastric cancer. Eur J Cancer. 2008 Nov;44(16):2397-403. ↑ Qin J, Liu M, Ding Q, Ji X, Hao Y, Wu X, Xiong J. The direct effect of estrogen on cell viability and apoptosis in human gastric cancer cells. Mol Cell Biochem. 2014 Oct;395(1-2):99-107. 1 2 "What Are The Risk Factors For Stomach Cancer(Website)". American Cancer Society. Retrieved 2010-03-31. ↑ Venturi, S.; Donati, F.M. ; Venturi, A.; Venturi, M. (2000). "Environmental Iodine Deficiency: A Challenge to the Evolution of Terrestrial Life?". Thyroid. 10 (8): 727–9. doi:10.1089/10507250050137851. PMID 11014322. ↑ Jakszyn P, González CA; Gonzalez (2006). "Nitrosamine and related food intake and gastric and oesophageal cancer risk: A systematic review of the epidemiological evidence" (PDF). World J Gastroenterol. 12 (27): 4296–4303. PMC 4087738 . PMID 16865769. ↑ Alonso-Amelot ME, Avendaño M; Avendaño (March 2002). "Human carcinogenesis and bracken fern: a review of the evidence". Current Medicinal Chemistry. 9 (6): 675–86. doi:10.2174/0929867023370743. PMID 11945131. 1 2 Crew K, Neugut A (January 2006). "Epidemiology of gastric cancer". World Journal of Gastroenterology. 12 (3): 354–62. doi:10.3748/wjg.v12.i3.354. PMC 4066052 . PMID 16489633. ↑ Hampel Howard; Abraham Neena S.; El-Serag Hashem B. (August 2005). "Meta-Analysis: obesity and the risk for gastroesophageal reflux disease and its complications". Annals of Internal Medicine. 143 (3): 199–211. doi:10.7326/0003-4819-143-3-200508020-00006. ↑ Josefssson, M.; Ekblad, E. (2009). "22. Sodium Iodide Symporter (NIS) in Gastric Mucosa: Gastric Iodide Secretion". In Preedy, Victor R.; Burrow, Gerard N.; Watson, Ronald. Comprehensive Handbook of Iodine: Nutritional, Biochemical, Pathological and Therapeutic Aspects. Elsevier. pp. 215–220. ISBN 978-0-12-374135-6. 1 2 3 4 5 "Hereditary Diffuse Cancer". No Stomach for Cancer. Retrieved 21 Oct 2014. ↑ "Gastric Cancer — Adenocarcinoma". International Cancer Genome Consortium. Retrieved 24 February 2014. ↑ "Gastric Cancer — Intestinal- and diffuse-type". International Cancer Genome Consortium. Retrieved 24 February 2014. ↑ Tseng C-H, Tseng F-H; Tseng (2014). "Diabetes and gastric cancer: The potential links". World J Gastroenterol. 20 (7): 1701–11. doi:10.3748/wjg.v20.i7.1701. PMC 3930970 . PMID 24587649. ↑ Virmani, V; Khandelwal, A; Sethi, V; Fraser-Hill, M; Fasih, N; Kielar, A (2012). "Neoplastic stomach lesions and their mimickers: Spectrum of imaging manifestations". 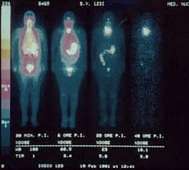 Cancer Imaging. 12: 269–78. doi:10.1102/1470-7330.2012.0031. PMC 3458788 . PMID 22935192. ↑ Xu ZQ, Broza YY, Ionsecu R, et al. (March 2013). "A nanomaterial-based breath test for distinguishing gastric cancer from benign gastric conditions". Br. J. Cancer. 108 (4): 941–50. doi:10.1038/bjc.2013.44. PMC 3590679 . PMID 23462808. Lay summary – Medical News Today ("Breath Test Could Detect and Diagnose Stomach Cancer") (6 March 2013). ↑ "Detection of precancerous gastric lesions and gastric cancer through exhaled breath". Gut. 13 April 2015. doi:10.1136/gutjnl-2014-308536. ↑ Kumar; et al. (2010). Pathologic Basis of Disease (8th ed.). Saunders Elsevier. p. 784. ISBN 978-1-4160-3121-5. ↑ "Detailed Guide: Stomach Cancer Treatment Choices by Type and Stage of Stomach Cancer". American Cancer Society. 2009-11-03. ↑ Guy Slowik (October 2009). 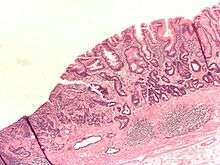 "What Are The Stages Of Stomach Cancer?". ehealthmd.com. ↑ "Detailed Guide: Stomach Cancer: How Is Stomach Cancer Staged?". American Cancer Society. ↑ Ford, AC; Forman, D; Hunt, RH; Yuan, Y; Moayyedi, P (20 May 2014). "Helicobacter pylori eradication therapy to prevent gastric cancer in healthy asymptomatic infected individuals: systematic review and meta-analysis of randomised controlled trials.". BMJ. 348: g3174. doi:10.1136/bmj.g3174. PMC 4027797 . PMID 24846275. ↑ Woo HD, Park S, Oh K, Kim HJ, Shin HR, Moon HK, Kim J (2014). "Diet and cancer risk in the Korean population: a meta- analysis" (PDF). Asian Pacific Journal of Cancer Prevention. 15 (19): 8509–19. doi:10.7314/apjcp.2014.15.19.8509. PMID 25339056. ↑ Kong, P; Cai, Q; Geng, Q; Wang, J; Lan, Y; Zhan, Y; Xu, D (2014). "Vitamin intake reduce the risk of gastric cancer: meta-analysis and systematic review of randomized and observational studies.". PLOS ONE. 9 (12): e116060. doi:10.1371/journal.pone.0116060. PMC 4280145 . PMID 25549091. ↑ Bjelakovic, G; Nikolova, D; Simonetti, RG; Gluud, C (16 July 2008). "Antioxidant supplements for preventing gastrointestinal cancers.". Cochrane Database of Systematic Reviews (3): CD004183. doi:10.1002/14651858.CD004183.pub3. PMID 18677777. ↑ Bjelakovic, G; Nikolova, D; Gluud, LL; Simonetti, RG; Gluud, C (14 March 2012). "Antioxidant supplements for prevention of mortality in healthy participants and patients with various diseases.". Cochrane Database of Systematic Reviews. 3: CD007176. doi:10.1002/14651858.CD007176.pub2. PMID 22419320. ↑ Best, LM; Mughal, M; Gurusamy, KS (31 March 2016). "Laparoscopic versus open gastrectomy for gastric cancer.". The Cochrane database of systematic reviews. 3: CD011389. doi:10.1002/14651858.CD011389.pub2. PMID 27030300. Retrieved 5 April 2016. ↑ Sun, J; Song, Y; Wang, Z; Chen, X; Gao, P; Xu, Y; Zhou, B; Xu, H (December 2013). "Clinical significance of palliative gastrectomy on the survival of patients with incurable advanced gastric cancer: a systematic review and meta-analysis." (PDF). BMC Cancer. 13 (1): 577. doi:10.1186/1471-2407-13-577. PMID 24304886. 1 2 Fusco N, Rocco EG, Del Conte C, Pellegrini C, Bulfamante G, Di Nuovo F, Romagnoli S, Bosari S (Jun 2013). "HER2 in gastric cancer: a digital image analysis in pre-neoplastic, primary and metastatic lesions". Mod Pathol. 26 (6): 816–24. doi:10.1038/modpathol.2012.228. PMID 23348899. ↑ "Are the number of cancer cases increasing or decreasing in the world?". WHO Online Q&A. WHO. 1 April 2008. Retrieved 2009-05-11. ↑ Lozano, R; Naghavi, M; Foreman, K; Lim, S; Shibuya, K; Aboyans, V; Abraham, J; Adair, T; Aggarwal, R; Ahn, SY; Alvarado, M; Anderson, HR; Anderson, LM; Andrews, KG; Atkinson, C; Baddour, LM; Barker-Collo, S; Bartels, DH; Bell, ML; Benjamin, EJ; Bennett, D; Bhalla, K; Bikbov, B; Bin Abdulhak, A; Birbeck, G; Blyth, F; Bolliger, I; Boufous, S; Bucello, C; et al. (15 December 2012). "Global and regional mortality from 235 causes of death for 20 age groups in 1990 and 2010: a systematic analysis for the Global Burden of Disease Study 2010". Lancet. 380 (9859): 2095–128. doi:10.1016/S0140-6736(12)61728-0. PMID 23245604. ↑ "PRESS RELEASE N° 224 Global battle against cancer won't be won with treatment alone: Effective prevention measures urgently needed to prevent cancer crisis" (PDF). World Health Organization. 3 February 2014. Retrieved 14 March 2014. ↑ "Gastric Cancer in Young Adults". Revista Brasileira de Cancerologia. 46 (3). Jul 2000. ↑ "Health profile: United States". Le Duc Media. Retrieved 31 Jan 2016. ↑ "Health profile: China". Le Duc Media. Retrieved 31 Jan 2016. ↑ "Stomach Cancer: Death Rate Per 100,000". Le Duc Media. Retrieved 13 March 2014. ↑ "Stomach cancer statistics". Cancer Research UK. Retrieved 28 October 2014. 1 2 3 4 Asombang Akwi W; Rahman Rubayat; Ibdah Jamal A (2014). "Gastric cancer in Africa: Current management and outcomes". World Journal of Gastroenterology. 20: 3875–79. doi:10.3748/wjg.v20.i14.3875. 1 2 Louw J. A.; Kidd M. S. G.; Kummer A. F.; Taylor K.; Kotze U.; Hanslo D. (November 2001). "The relationship between helicobacter pylori infection, the virulence genotypes of the infecting strain and gastric cancer in the African setting". Helicobacter. 6 (4): 268–73. doi:10.1046/j.1523-5378.2001.00044.x. ↑ Withrow SJ, MacEwen EG, eds. (2001). Small Animal Clinical Oncology (3rd ed.). W.B. Saunders.